Muldera multinervis Miq. in Hook., Lond. J. Bot. 5: 537. 1846. Muldera wightiana Miq. in Hook., Lond. J. Bot. 5: 558. 1846. Piper aromaticum Lam., Tabl. Encycl. 1: 79. 1791. 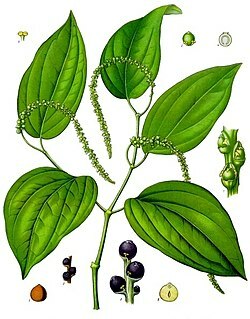 Piper nigrum var. trioicum (Roxb.) DC., Prodr. 16(1): 363. 1869. Piper trioicum Roxb., Fl. Ind., 1: 153. 1820. Mansfeld's World Database of Agriculture and Horticultural Crops (1998 onwards) IPK Gatersleben. Accessed: 20013 03 29. USDA, ARS, Germplasm Resources Information Network. Piper nigrum in the Germplasm Resources Information Network (GRIN), U.S. Department of Agriculture Agricultural Research Service. Апошняе змяненне старонкі адбылося 08:41, 18 красавіка 2019.